I know I promised no bike posts for a while, but this one is about Gareth, so I'm going to break my promise. A couple weeks ago our friend told us that he had SPD shoes that his youngest son (a year older than Gareth) had outgrown. We have extra pedals lying around because Ryan accidentally ordered two pair too many when he ordered ours several months ago. So at the urging of our friend we decided to let Gareth try SPDs. Because we wanted to laugh at him when he inevitably fell. Or share with him the joy of clipped-in pedaling. Mostly the latter, but a little of the former. Gareth was excited about this and I finally picked up the shoes on Friday and then he spent all weekend begging me to put the pedals on his bike. Ryan got the old ones off today, so Gareth got to try them out this afternoon. I loosened the clips all the way to make things a little easier on him. He got the hang of it pretty quickly, so we graduated to the backyard. Malcolm wanted to join in the fun, and for the first time in over a year asked to ride his bike as well. He didn't stay on it long, and a couple times just wanted to sit on it for a few minutes without riding. But that's progress. I think I let him try it out too soon and he wasn't strong enough to hold it up yet (despite its light weight) and he got freaked out. So I'm feeling good that I didn't screw him up forever. Back to Gareth. He graduated to the backyard and proceeded to fall down a few times. I have video, but video from my phone doesn't work on Blogger ever. If I figure out a fix for that I'll add it. Anyway, he was keeping his right foot clipped in as it's the one he pushes off with. He was remembering to unclip his left foot. But then he'd lean to the right because he wanted to put his right foot down and down he'd go. 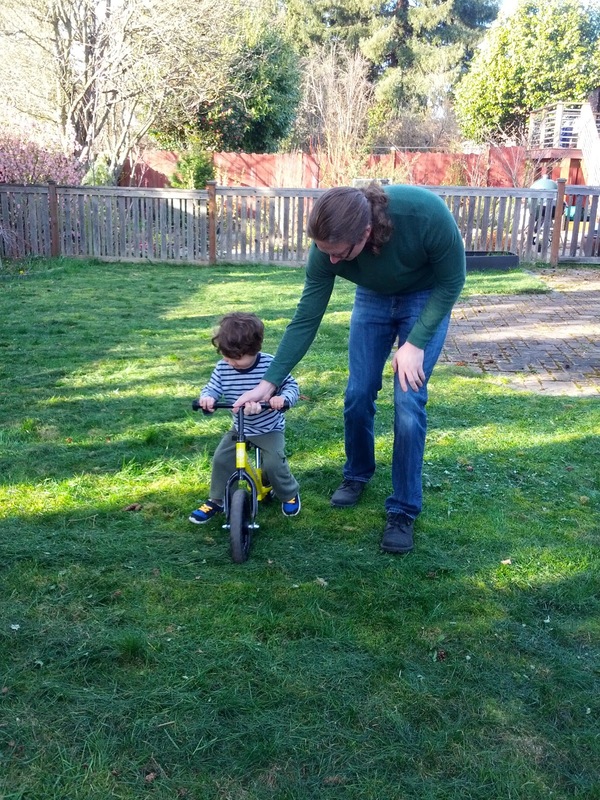 But after Ryan showed him how he does things on his bike and we both reiterated to him a few times that he needs to put his left foot down, not his right, he started to get the hang of it. 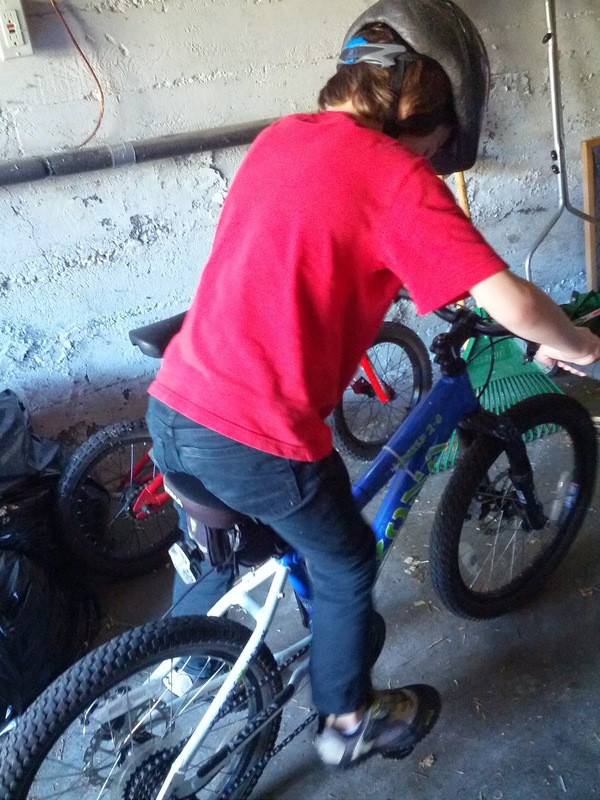 It also helped once we adjusted his bike seat higher, forcing him to not try to stay seated on it when stopped. After several successful rounds in the backyard he got to go out to the sidewalk and try riding up and down the sidewalk a few times. As far as I'm aware, he managed not to fall at all. Go Gareth! Way to go Gareth! Ryan, you are an example to all of us fathers out here. I think freedom of travel is in the constitution. The Phelps family is one step ahead of the rest of the world. Keep the rubber side down and keep rolling!